Coconut Cream Pie has it all, lightly toasted meringue, toasted coconut and creamy coconut filling in a flaky homemade crust. Yesterday a friend hosted her annual dessert party and aside from designing her invites, I offered to help out with the baking. What better dessert to bring to a gathering than pie? There is just something so festive about it during the holidays. I’ll admit, when she first asked me what I wanted to make I said, “I don’t know?” but then I immediately thought of this pie. This recipe was passed on to me from my mother in law, she has tons of recipes like this one that are favorites among family and friends – she baked 5 for Thanksgiving if that is any indication. The resulting pie speaks for itself, a beautiful meringue atop a smooth layer of sweet coconut cream that sits in a delicious, flaky homemade crust. This is one recipe I am sure you are going to love; enjoy and happy baking! Take out 1/3 of this mixture and mix with 2 Tbs of water to form a paste. Cut crisco into the remaining flour until the pieces are the size of small peas. Add the flour paste to Crisco-flour mixture, mixing thoroughly until the dough comes together and can be shaped. Bake at 425º for 12-15 minutes. In a pot over medium heat combine the sugar, corn starch, salt, egg yolks and milk. Stir the mixture constantly until it boils, remove from heat and add the vanilla and coconut. Pour the mixture into your pre-baked pie shell. lightly browned. Lower the temperature to 325º and bake for an addition 3-5 minutes. Remove carefully from the oven and cool completely before serving. My husbands favorite, I will have to try it! I love a good pie! Looks delicious! 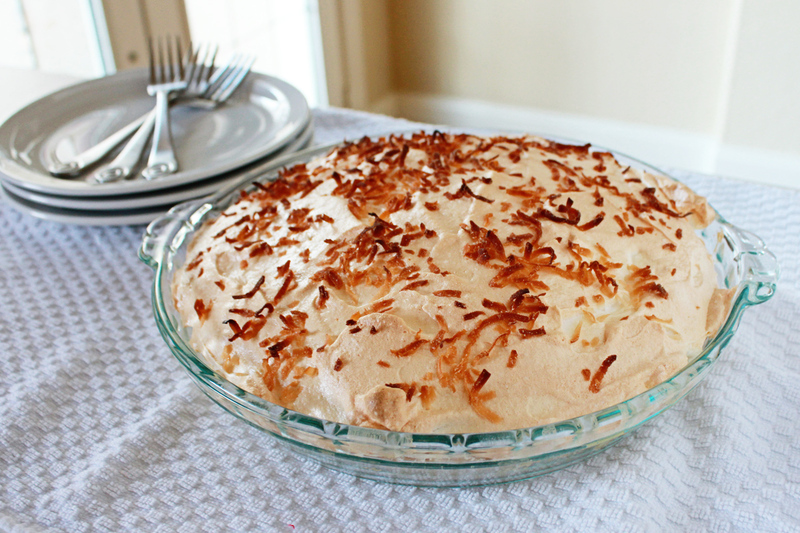 I love coconut cream pie and yours looks delicious! This sounds wonderful, Emily! I haven’t had a Coconut Cream Pie in ages. Thank you for sharing at All my Bloggy Friends this week.